This coming Saturday, March 8th, we will march together in Brussels with ‘Karzar’ an Iranian women’s coalition. We want to shout out our rage against the horrendous situation of women in Iran and against the enormous repression that women’s organisations are facing there. It is a show of solidarity and support to the hundreds of women activists who have been jailed and murdered for their ideas. 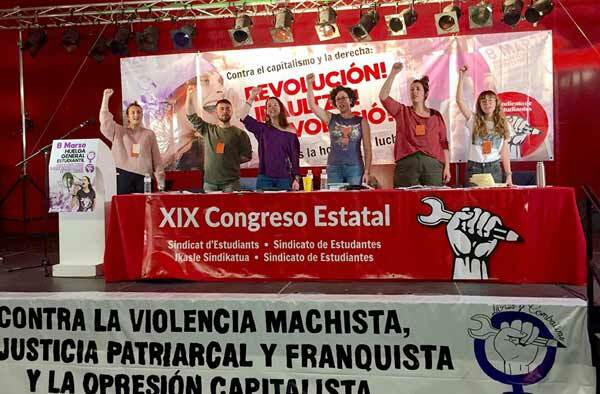 But we want to shout loud as well our protest against imperialism: no western intervention has ever improved the lives of women and children, quite the contrary. The demonstration will be starting at the US embassy, where women from Iraq and Afghanistan will speak out against imperialist intervention. In Afghanistan, women’s position under the Taliban was used heavily in the war propaganda of the US and of their European allies. Images of burka-free women in Kabul were used to show how the western forces play a “liberating” role. But this is just propaganda; in reality life has not improved for Afghan women. The acceptance of sharia law, without any safeguards for women, by the western forces allied in Nato, shows women’s liberation was never one of their goals. On top of being held down by their own elite on the basis of religious and local reactionary traditions, women in Afghanistan suffer from the devastation the war has brought. The few resources that are being put in are used to bolster an elite, with massive corruption being evident on all levels, and for military operations, leaving most of the country the choice between the drug lords or the Taliban forces – a choice between the plague and cholera. In Iraq the same story can be seen. Massive funds are being put into a war that goes on to devastate people’s lives. By now the number of victims in the Iraq population must have risen to over a million, taking into account also the deaths that have occurred because of the destroyed infrastructure. Whereas the oil is being well protected, the masses of the population face growing chaos and violence, hunger, lack of necessary services. In Iraq as well, the US-protectors have accepted sharia law and all it brings with it for women. “Doa”, a young Kurdish woman, was brutally battered, trampled on and stoned to death by her tribe. She became the code name for hundreds of Kurdish women who were cruelly murdered to preserve the men’s “honour” under the protection of the American-based Kurdish government in Iraq. Thousands and thousands of Iraqi women sought refuge in Syria just to find themselves dancing in Damascus’ night clubs to attract preying clients for pitiful survival money. Afghan women were repeatedly raped in “Pol charkha” prison by the police trained by the so-called ‘Peace Keeping Forces’. No to the anti-social European Union project! The demonstration in Brussels will then pass by the EU parliament building. There, trade-unionists will explain how the EU-project has attacked workers’ conditions, wages and social security, and how that has affected women. In Belgium, as in many EU countries, the neo-liberal policy of the nineties was justified by arguments about the necessity of reaching the Maastricht-norms, with emphasis on driving down the state deficit. It was used to justify a witch-hunt against the unemployed, hitting women extremely hard. In the nineties almost 200,000 people saw their benefits suspended as long-term unemployed people who lived with someone who has an income no longer had the right to benefits. 92% of those losing their benefits were women. Before that, part-time unemployment benefits given to part-time workers to allow them a real income were already mostly abolished. Such measures have had an effect on women. Although more women than ever go out to work, this does not mean they have gained financial independence. Part time work has grown substantially in the last 10 to 20 years and it is mostly women who are involved. In all EU countries, a witch hunt on the unemployed has been accompanied by the establishment of special job schemes, creating new kinds of “jobs” - all of them paying extremely low wages and giving out short term contracts. Low benefits and a growing number of jobs that do not offer you a salary high enough to live on mean for instance that one in three single mothers is officially poor. The pension reform of the nineties (bringing the number of “career years” women need to get for a full pension to the same level as men: from 35 to 40 years) is in the meantime creating a growing number of poor female pensioners. The neo-liberal policy of privatisation and liberalisation has also run down public services to a great extent, leaving the family - and most of all the women in the family - to cope with the extra work. Hospitals send people home as soon as possible. There are big shortages in all major care sectors, be it in care for disabled people, with thousands being on waiting lists to get the specialised care they need, or in child care and care for the elderly, which is often far too expensive. Far from setting an example, the European Union, with this undermining of workers’ conditions and income, with this destruction of social security systems and public services, is turning back the clock for a lot of women. It leaves many of them with the choice of dependence on a male wage earner or poverty. Women being over-represented in low income groups, they are hit extremely hard now that food prices are going up rapidly, following high increases of housing and energy prices in recent years. For an end to the horrendous position of women in Iran! The demonstration stops for the last time in front of the Iranian embassy. We want to show the Iranian regime that our opposition against imperialism does not in any way mean we will accept the horrible situation of women in Iran, who are suffering under barbaric oppression and whose lack of rights is inscribed in law. Anti-imperialist struggle and the fight for women’s rights have to go hand in hand. In Tabriz, a woman was barbarically left suspended on a loosely fastened rope from a gallows and torturously struggled until she died. Afterwards, the Islamic regime exhibited her body at a prominent place so that other women could learn a lesson and not challenge the Islamic regime. The Islamic patrol guards arrested Zahra, a young Iranian woman, raped and murdered her. Her fate is added to the thousands of women who have been raped in the Islamic regime’s prisons in the last 28 years. Thousands of women in Iran have been beaten and arrested for not following the proper Islamic code of dressing. Struggle against the regime is always answered by a stepping up of repression. Women activists get arrested and sent to prison on fictitious “unlawful conduct” charges. In spite of such atrocities, considered “normal” in the present Iranian society, women continue their struggles and reach out to the rest of the world for support. Karzar is a women’s coalition of Iranian left wing organisations, which fights for the abolition of all barbaric and unequal laws against women, including stoning, forced veiling, gender apartheid. It fights to secure the right of women to divorce, their right to keep children after divorce, for total control over their bodies, the right to choose their partners - as heterosexuals or as lesbians. Karzar also aims to eliminate any religious control over, or interference in, any aspect of women’s lives. The alliance has organised International Women’s Day activities in Europe - Germany and the Netherlands - in recent years and they have asked the help of LSP/MAS to organise it this year in Brussels. We see this as an excellent opportunity to show support to the women’s movement in Iran, as well as a chance to get to know the oppositional movements in that country. There is a danger that many of the European left, in the fight against US imperialism and with the threat of a US intervention in Iran in the background, will “forget” the necessity of fighting this brutal regime, which is extremely repressive against every form of opposition. We would, as would Karzar, fight a US intervention and mobilise against it, as we mobilised against the intervention in Iraq. But not to support the present Iranian regime, but in support of the masses of the Iranian population, who are victims of this regime and who would be victims again under a US-intervention, as the example of Iraq shows. In this way we want to honour the internationalist and working class traditions of International Women’s Day. The bourgeoisification of the old workers’ parties all over the world has also meant there are no more big demonstrations on the 8th of March. Instead, International Women’s Day has become a day in which most of the world sheds a tear about women’s poverty and hardship, rather than fight. Studies will show how women are hard hit by wars, by economic and social degradation all over the world, by physical and sexual violence. They will show the many forms that women’s oppression takes. But they will show no way out, the only result being new promises that will not be kept. The way out for the overwhelming majority of women, as for all workers, is in the rebuilding of strong workers’ parties which can reclaim this internationalist tradition and give it new life. These parties are necessary for the working class to unite its forces and work out its strategies. LSP/MAS, like other sections of the CWI, is making every effort to help forward that development. In new parties and formations we advocate the idea that the working class should defend and assemble all oppressed and exploited layers, fighting against the capitalists’ divisions and for working class unity. Our motto is: ‘No women’s liberation without socialism, no socialism without women’s liberation’.